This time, we bring you a wonderfully refreshing and touching tale of the eternal bond of true and divine friendship between man and God - the bond that verily uplifts the Jeevatma to the level of the Paramatma and makes him one with the Creator. We present before you the story of Krishna and Sudama. Sudama, who was also known as Kuchela in South India, was a childhood friend of Lord Sri Krishna. Legend has it that Sudama was Narada, who took birth on Earth in order to enjoy and participate in the many lilas (spiritual pleasures) of Krishna. 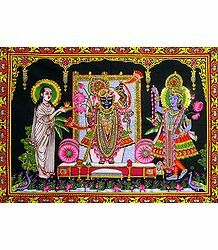 Narada is a divine sage and eternal devotee of Lord Vishnu. Sudama was born in a poor Brahmin family, to Matuka and Rochana Devi. Krishna, on the other hand, hailed from the royal family and hence, enjoyed the highest possible social status. However, this difference did not in any way hinder their friendship - the two were inseparables all the way through the tenure of their schooling while in Vrindavan. They studied together at Acharya Sandipan's ashram (hermitage). Krishna and Sudama once went to the forest to gather brushwood. They stayed on there for long, walking and chatting with each other, while also enjoying the beauty of their environs. It started getting quite late and Krishna got hungry. Sudama, in the meantime, had some grams with him. However, he felt embarrassed to offer this simple food to his friend, who hailed from a royal family. Krishna kept telling him how hungry he was and asked his friend if he had anything at all to eat. Sudama denied taking along anything to eat. In due course of time, Sudama got married to Susheela and became a householder. However, he never had any interest in accumulating wealth. He was happy to live frugally, desiring no material gains. He accepted his financial status and preferred to spend time in the contemplation of the Supreme Godhead. He had not much money to spare for his wife and children. There were many times when the family did not even get two square meals. The children often cried out due to hunger and drank a lot of water to try and satiate themselves. Sudama's wife repeatedly requested her husband to visit his old friend Krishna and beseech him for some financial assistance. She would remind him that he being a true Brahmin, a devotee and long-lost close friend of Krishna, the latter would be only too willing to help him in his time of trouble. Susheela, like her husband, was not bothered about acquiring material treasures; but she was concerned about the health of her family, especially that of her children. An arrogant knight lived in the same town as Sudama. He hated Krishna's popularity and the fact that so many were devoted to him. Since Sudama was one of the most ardent devotees of Krishna, the knight hated him too. He once called Sudama and told him that the latter would get anything he wished for, if he would only chant the former's name. However, Sudama chose to defy the vain man and firmly stated that he would chant only the Lord's name and no one else's. The knight kept threatening him with dire consequences if he continued with his defiance, but Sudama did not waver and stood firm with his beliefs. In the meantime, Susheela kept begging her husband to visit his old friend Krishna, knowing that he would help in their time of need. Sudama was reluctant to ask such a big favor of Krishna. Besides, his view was that, Krishna being God, he would already know everything and would be aware of their suffering, without them having to go and complain to him. The knight was further enraged by Sudama's utter lack of regard for him and decided to teach him a lesson. He went over to the latter's home and began hitting him. 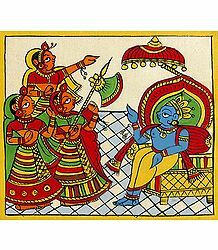 At the very moment, Krishna, sitting in his palace with his wives Rukmini and Satyabhama, felt the actual physical pain of the knight's attack on Sudama. He knew all that Sudama was going through, but kept silent, wanting the latter to approach him first. Each time the knight hit Sudama, Krishna bore the brunt silently. His wives wondered why he was repeatedly wincing, but he nevertheless kept mum and did not explain the reason for his strange behavior. The knight continued punishing and hitting Sudama for days, but the latter yet refused to visit Krishna. Finally, not able to take it anymore, Susheela ordered him to leave forthwith and request help from the Lord. He eventually agreed to visit his long-lost royal friend at Dwaraka. He realized that it would not be nice to go empty-handed to visit the King and so, he asked his wife to prepare some foodstuff that he could present before Krishna. Having nothing to eat in the house, she picked up some flattened rice or "poha" and packed it in a little piece of cloth. 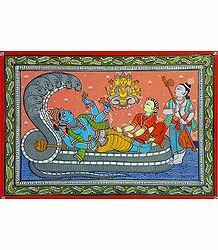 Sudama took it and happily left for Dwaraka. Reaching Dwaraka, Sudama stared in amazement at the massive gates of the palace, and then entered therein, passing through several military camps and residential quarters on the way. Once inside, he saw Krishna seated with Rukmini. The Lord immediately got up and warmly received Sudama, fondly embracing him. The palace attendants were shocked to see their King behaving in such a fashion with this humble, obviously very poor Brahmin. Sudama was completely overwhelmed by the rousing welcome that Krishna gave him. The Lord asked him to be seated and, in traditional fashion, washed Sudama's feet, as a mark of respect for a Brahmin. Krishna then took some of the water used to wash his feet and sprinkled it over his own head. He then offered Sudama food and drink to refresh him after his long journey. Krishna then seated Sudama on his own plush bed and then both settled down to remember their days of childhood. The latter was thrilled by his friend's memory of the wonderful days gone by; of all the adventure they had had together during their time at their Guru's ashram. The Lord recounted several incidents during their time together, including one where the boys entered the forest to collect dried wood, on the order of their Guru's wife. They got lost in the forest and could not find their way back. All of a sudden, there was a vicious dust storm and then thick clouds covered the sky, with thunder and lightning making the entire atmosphere even more eerie and unsettling. Sunset arrived all too soon and the dense forest stretched never-endingly before them. It soon started to rain heavily; flooding the entire area. The young boys were dismayed by the devastation all around and decided to stick very close to each other. Holding each others' hands, they tried in vain to find their Guru's home. They were trapped in the forest all night and the next morning, the Guru sent his other disciples to look for them. After a long search, they found the boys, utterly shaken, tired, sleepy and hungry. The Guru was very touched by the boys' devotion to him and blessed them with all goodness and knowledge. Krishna talked in detail about the incident, relating how lucky they were to find such a spiritual master and how his blessings had helped them achieve much in their own lives. Sudama was wonderstruck by the Lord's own humility and how simple he was, in spite of being the Lord God; the Controller of the whole Universe. They talked for a long time, after which Krishna finally asked Sudama what the purpose of his visit was and the reason why he had come to see him. 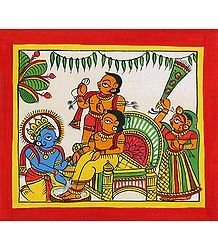 Krishna's mood turned jovial and, with a mischievous glint in his eye, he asked his friend what the latter had brought him as a gift and if his wife had packed some nice eatables. Reluctantly and feeling very embarrassed, Sudama offered him the packet of flattened rice. Krishna, knowing what his friend was thinking, enthusiastically opened the packet and was very happy when he saw the contents inside it. He decided he would partake of the rice and then richly reward Sudama for the same. The Lord grabbed a handful of the foodstuff and happily ate it up. 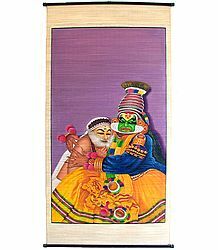 When he tried to put in a second mouthful though, his wife Rukmini, the Goddess of Fortune, held his hand and shook her head ever so slightly. She meant to tell him that with one handful of the rice, Sudama would become extremely wealthy in his present life. But with a second handful, he would continue to reap riches even in his next life. She was already obliged by Sudama's offering, to stay in this Brahmin's house and shower her grace in his present birth. She did not wish to continue doing so in his next birth as well. Sudama then understood that all of this was Krishna's doing. The Lord had been silently watching him and his suffering for all these years. But his small, seemingly meaningless offering of the poha had paid rich rewards. He had been bestowed wonderful and incomparable riches and a palace, beautiful beyond human imagination. Sudama then prayed to Krishna, promising that he would never forget his Lord in the midst of all this wealth and opulence. He accepted Krishna's grace as prasadam and also resolved to use the money on serving the Lord. He lived peacefully with his wife and spent the rest of his life in luxury. However, he did so with a permanent and unwavering sense of gratitude and devotion toward the Lord, never once falling into the trap of ego and greed that wealth, power and position invariably bring with them. The Lord's grace proportionately increased day after day, bestowing more well-being, happiness and peace on him. It is believed that Sudama met Krishna at Dwaraka on the sacred day of Akshaya Tritiya. This day occurs just once a year and falls on the third day of the bright half of the Vaishakh month, during April-May, according to the English calendar. On this day, the Sun and the Moon are in exalted position and shine at their brightest. The word "Akshaya" signifies unending, imperishable or eternal. It is considered that valuables bought or new beginnings made on this day bear fruit and bring immense success and good fortune to the doer. 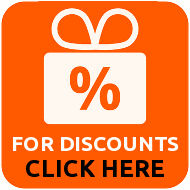 This is why people traditionally purchase gold, silver and other valuables on this day. Akshaya Tritiya is also considered an auspicious day for conducting weddings, begin new business ventures and even undertake long-distance journeys. On this day, many Hindus bathe in holy rivers, conduct elaborate Poojas, make charities, and offer barley in havans (sacred fire rituals). Lord Ganesha, the Elephant-Headed Lord and Devi Lakshmi, the Goddess of Wealth are also worshipped on this day. Sudama suffered immense poverty for most of his life. This suffering was due to his karma. As mentioned earlier, during their childhood, Sudama had once eaten his food on the sly, without sharing the same with a very hungry Krishna. Sudama, being young himself, had not known the omnipotent and omniscient nature of Lord Sri Krishna and so, had not understood that this was all a mere lila or divine play on the part of Krishna. The latter had known all along what his friend was doing, but he had kept silent, only so that Sudama could finish his life's karma by way of this incident. However, when Sudama offered Krishna a handful of poha; Krishna, the Supremely Benevolent One and the caretaker of his devotees; immediately rewarded him with unimaginable wealth and riches that would last him a lifetime. Since Sudama had by then realized Krishna's divinity and started spending his new-found riches on charity, the latter kept showering him with even more grace and wealth that lasted all his life. All are equal in the eyes of the Lord and He does not differentiate between people based on petty caste, wealth and social status. We too should learn to respect each individual, as each one is a creation of that Supreme Being. God always rewards good deeds; however, He is also bound by the Laws of Karma. He knows when to bestow His grace on us. It may take a while for us to reverse negative karma and start enjoying the fruit of our good deeds, but it is bound to come to us in time. Till such a time arrives, we merely need to keep up with good karma. Bhakti or devotion toward God is the only thing that will lead us to His grace. Also, praying and conducting elaborate Poojas expecting material gains in return will never help us attain the Lord's grace. Instead, being pure of thought, word and deed and offering our heart and soul to Him will give us everything we would ever need. It is said that Annadaan or the act of offering food is the greatest ever charity man can perform in his lifetime. By offering the Lord a handful of poha, Sudama had unknowingly done the greatest deed of feeding the Universal Form of the Lord Himself. With this handful of the rice, Krishna, in his Universal Form, fed all the creatures of the world. This act of Sudama wiped out all his negative karma in one single moment of time; while also earning him enough good karma to last several more lifetimes! Sudama was extremely poor and could not afford even that packetful of poha. His family would go hungry for days on end, sometimes drinking only water in an attempt to satiate their hunger. In his case, therefore, the fact that he took the trouble to feed the Lord in spite of his own destitute condition was enough reason for him to earn a tremendous amount of good karma. As mentioned above, it was extremely difficult for Sudama to afford even a small packet of rice to offer to his friend Krishna. Krishna, on the other hand, was a King and so, bestowing so much wealth on Sudama was easy for him. Looking at the story from this angle, Krishna was only returning Sudama's favor. Sudama had come to Krishna, merely to express his love toward him. He had nothing to offer and yet, he did not beg for anything. Instead, he actually ended up feeding the Lord Himself. Krishna too knew very well that true, selfless love and friendship such as Sudama's would only give and never take. The Lord himself was impatiently waiting for his poor friend's arrival, so that He could liberate him from all his negative karma. While Krishna's gift was rare and precious, Sudama's gift was invaluable and priceless. The Lord knew the amount of difficulty his friend would have gone through in bringing the packet of poha to him. Knowing Sudama's pure and undiluted love and devotion for him, he had to respond with much greater love and affection. This shows that a true devotee's love invariably forces God to bestow several times more love and grace on him. While God is in no way committed to respond to everyone's prayer, He simply has to respond to a devotee who showers this level of love and bhakti on Him.